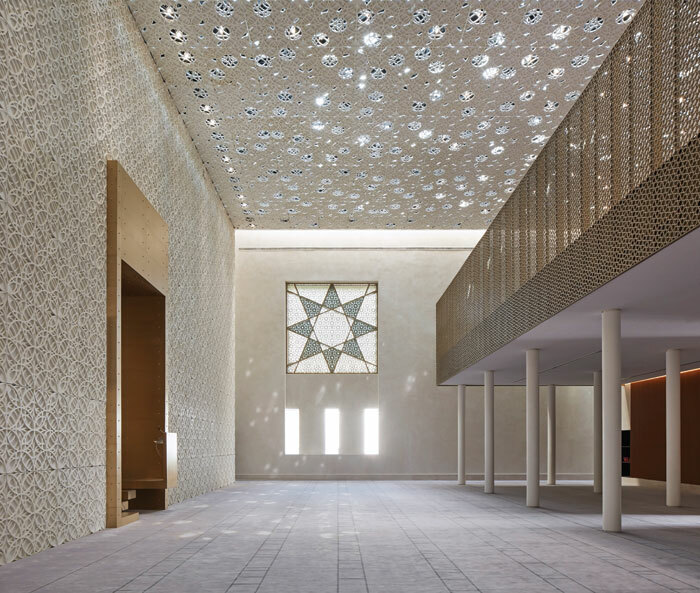 Located within the Msheireb Heritage Quarter, the design of the Jumaa Mosque fuses the crisp simplicity of modernism with a more historical arrangement of volumes and spaces, which reflects and celebrates the simplicity and rawness of traditional Qatari mosque design. John McAslan + Partners worked very closely with the client team to ensure that the building reflects the region’s cultural values in looking forward as well as back. A greater sense of welcome is afforded through one of the compound walls being permeable – it’s rare for people at street level to be allowed a glimpse of mosque life. Generous shading and shelter within the first courtyard gives pilgrims and visitors a moment of respite and calm. The traditional form is followed – a double square – as well as traditional geometric patterning, but the experience starts with simplicity, and the layers of detailing become richer as the visitor or worshipper moves in towards the central prayer hall. Here a dazzling display of patterned light can be experienced through perforations in the machine cut GRP roof and wall panels. Women – who play a leading role in Qatari cultural and civic life – are not tucked away in a separate place to worship, but are included in the main prayer hall, in a mezzanine level prayer room that is screened off by an elaborate bronze grille, but through which the same decorative patterning of sunlight can be experienced. The very civic square experience of the buildings is offset by a delicate stone-clad minaret that tapers towards the top, so that each course of stone had to be cut differently to achieve the desired effect. The complex has been designed to LEED gold standard. The mosque is constructed with an in-situ concrete frame with blockwork infill. Regional limestone is used as cladding, with Qatari stone for accent banding in the courtyard floor. Screens are cast in bronze, to add richness. Both passive and active sustainable technologies are deployed, including photovoltaics and solar hot-water heaters. The prayer hall is designed so that no artificial lighting is needed during daylight hours. 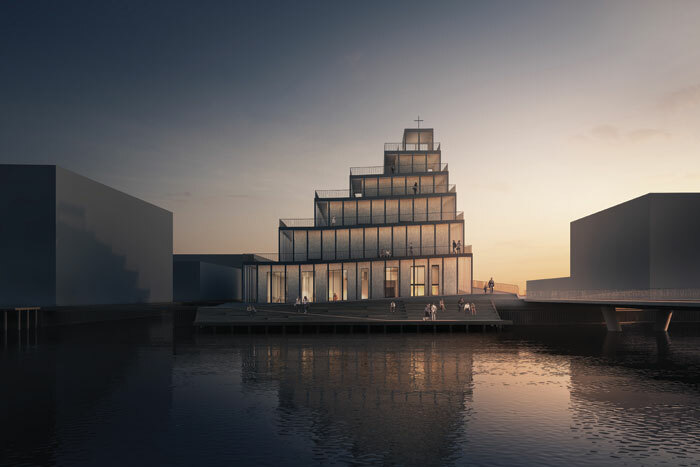 Jaja Architects recently won a competition, organised by the Danish Association of Architects, to design Copenhagen’s first new church in 30 years. Due to rapid population growth in the Sydhaven area, a building offering a spiritual breathing space for the individual and an urban space for the community was proposed. The site is a prime piece of waterfront in this rapidly regenerating district. Accessible to the public when ceremonies are not taking place, the church is presented in JAJA’s scheme as an upward-moving spiral walkway of ramps, with the harbour landscape merging with the church roof, enticing city dwellers to the top for the view. A colonnade, which follows the movement of the facade, offers a soft transition space between inside and out, steering visitors up the spiral walkway to access all the church functions without passing through the main entrance. The idea is that the terraces will form little havens, inviting people to pause and contemplate the space or look out on to the sea. The nave is on the top floor, in the form of a spiral at the centre of the church. The more sociable, community-facing aspects of church life are focused on the ground floor, where the main entrance leads in to a cafe and cultural spaces, although the active facades of the building allow scope for many different kinds of informal communal activity. Water plays a key part in the scheme, not just with the harbour-front setting, but also thanks to a sequence of water basins and gardens programmed to work with the shape of the church and the rainwater runoff. In this way, the building will itself become a waterfall, which can experienced from the colonnade. Potash Farm in Suffolk has been a place of retreat and respite since 2000, run by the London Buddhist Centre (LBC). 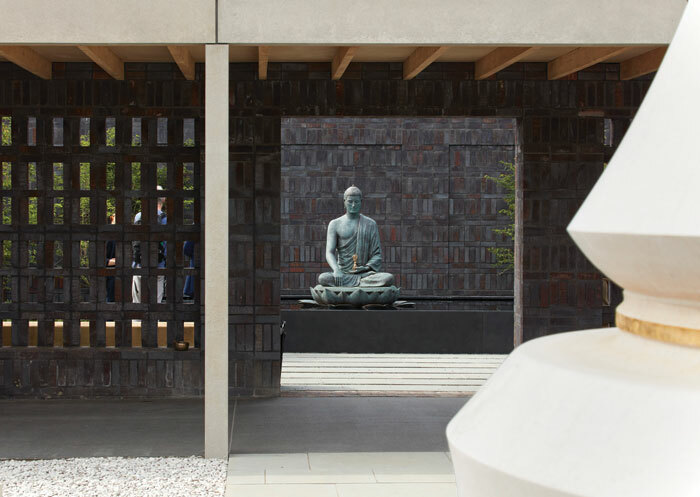 Thanks to a £4m refurbishment of several low-rise buildings by Walters & Cohen Architects, the Vajrasana Buddhist Retreat Centre recently reopened, now offering expanded and enhanced activities for its residents, visitors and the local community. An original 1903 farmhouse has been refreshed for staff quarters, while visitor accommodation is expanded from 34 to 60 people in a new, purpose-built, single-storey block, long, pitched-roofed huts clad in charred timber form a cloister,with living and dining areas along one side and bedrooms on the others. Minimally furnished communal spaces offer views on to the landscape, with skylights bringing in additional daylight. A further Temple Precinct comprises two smaller courtyards and a double-height shrine room, expressing the Buddhist ideal of ‘three jewels’, which progresses visitors from public to increasingly private space, ending in the ‘shrine’ room. Here a perforated brick wall enhances the sense of mystery and light as sunlight throws patterned shadows across the walls and floors. A golden Buddha statue provides the only adornment. 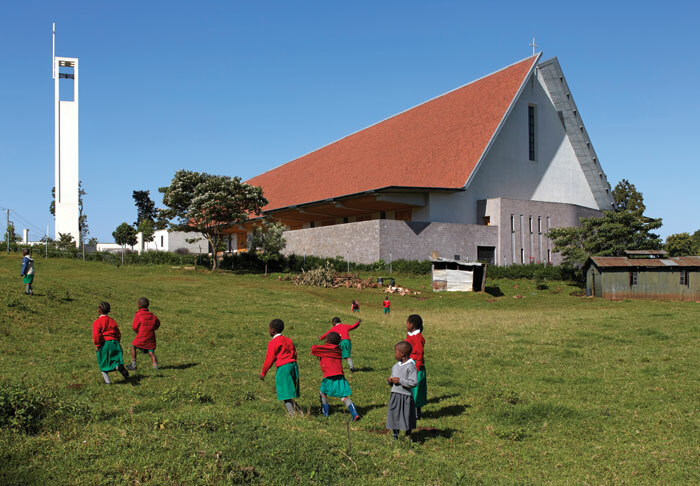 The Sacred Heart Cathedral of Kericho is a major new landmark and resource for the community of Kericho, 250km west of Nairobi. Close to the Rift Valley, with magnificent views of the surrounding hills and tea plantations, the cathedral’s vast inclined roof sits well within the rolling panorama of the surrounding hills and valleys. Although the local population is only 150,000, it is one of Kenya’s strongest Catholic diocese – and now its cathedral is the second largest in the country. John McAslan + Partners was appointed around 2010, and developed a visionary brief with Bishop Emmanuel Okombo. He saw the space as a stimulus for the congregation to assemble and grow, with a design to accommodate small, everyday worship and also large events, and demanding innovation in its use of local materials and craftsmanship. The cathedral compound is entered via a patterned metallic gate. The visitor passes a freestanding bell tower to face a small chapel. The main cathedral is to the right, and its heavy metal doors – designed and produced by Naoirobi-based Studio Propolis – are decorated with bas-relief bronze panels by Kenyan artists Florence Wangui and Rajinder. A stone podium integrates each of the building’s 10 concrete ribs into the ground through terraces, the steps of which connect to stone drainage channels designed to mitigate against torrential downpours during the rainy season, but also to control the flow of people into the church. The large roof eaves provide cooling and shade and feature metal gargoyles and gutters to channel rainwater away from the site to storage points to help with irrigation. The roof is clad in red clay tiles, made in Nairobi and cut and arranged in a pattern that evokes grapevines. Inside the church, bronze carvings, which depict the passages of the rosary, lead to the main nave, a vaulted trapezium-shaped space that splays towards the apse, in an evocation of the cross but also a gesture of welcome and inclusion. There is accommodation for 1,000 people in the pews, but a further 500 in the aisles; large exterior double doors can be opened up so that the congregation can expand further. Longitudinal skylights embedded in the roof’s spine are overlaid with a veil of delicate, timber finger-jointed battens, which help to create striking patterns over the interior when sunlight filters through. Natural materials dominate, with granite floors, terrazzo-clad walls and the timber lattice ceiling. The work of local artists is thoughtfully used. ‘A serious house on serious earth it is...which, he once heard, was proper to grow wise in...’ This quote from Philip Larkin summarised the client’s aspirations for a new chapel within the grounds of Ripon Theological College in Cuddeston, Oxfordshire. Serving two interconnected groups living on the same campus – the college community and the nuns of a small religious order – the chapel replaces one designed by George Edmund Street in the late-19th century, which was too small for the college’s current needs. 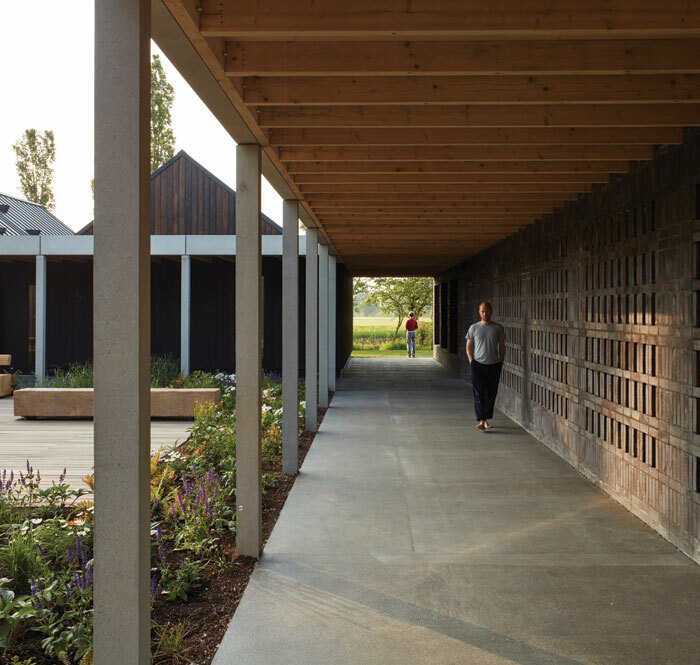 Niall McLaughlin Architects won the project, through an RIBA competition in 2009, to create a building that meets the functional and spiritual needs of its population. Sited within a clearing of mature trees, the chapel takes full advantage of its setting while avoiding overshadowing the Grade II listed buildings around it. 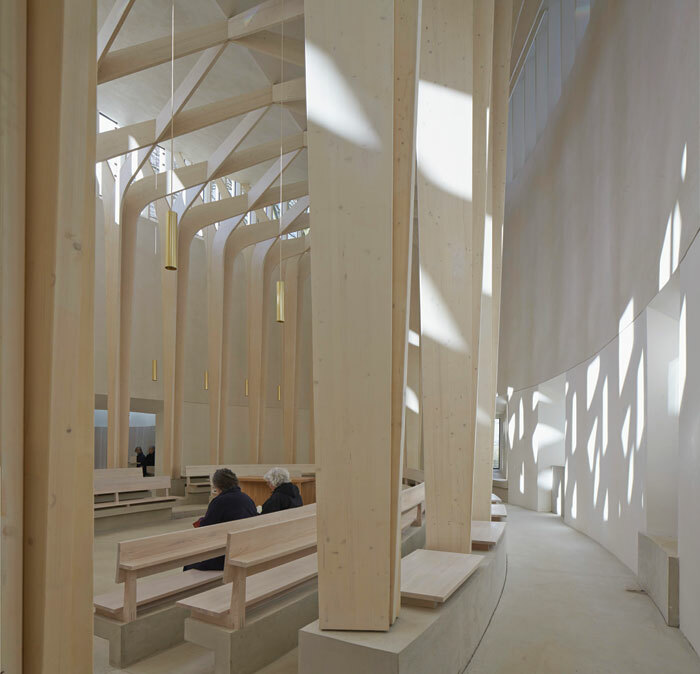 Inspired by the two meanings of the word nave – the central space in a church, as well as the root of the word ‘navis’, a ship – two architectural ideas emerged to inform the project: one is a hollow in the ground where a community meets (a ‘still centre’) and the other being the delicate ship-like timber structure that floats above the congregation. A third idea was to place a path around the chapel, looking into the bright space at the centre, as if looking into an illuminated clearing. In this way, the chapel harks back to the earliest churches. From the outside, the chapel appears to be a single stone enclosure, using Clipsham stone to complement the limestone of the existing college. The walls are of insulated cavity construction, with curved internal blockwork and an exterior of dressed stone. While the base of the chapel and ancillary structures are clad in ashlar stone laid in regular courses, the upper section is dressed in cropped walling stone, laid in a dog-tooth bond. At the top is a halo of natural stone fins. The roof and the internal frame, made of prefabricated glulam spruce sections, are self-supporting, with a minimal junction between the roof and the walls.